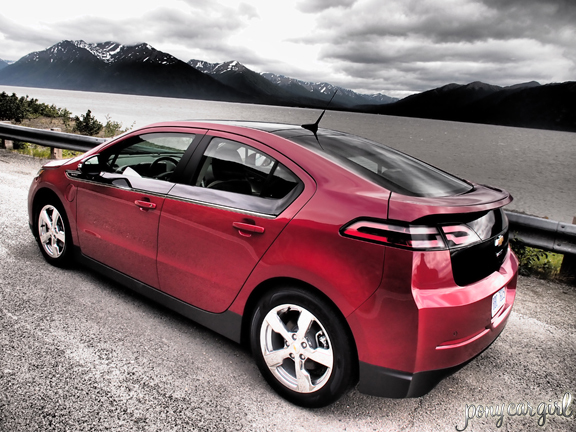 This past April, I was given the opportunity to go on a June road trip in a 2011 Chevy Volt and photograph it with the newly launched Olympus E-P3 camera. Can you even drive it that far? 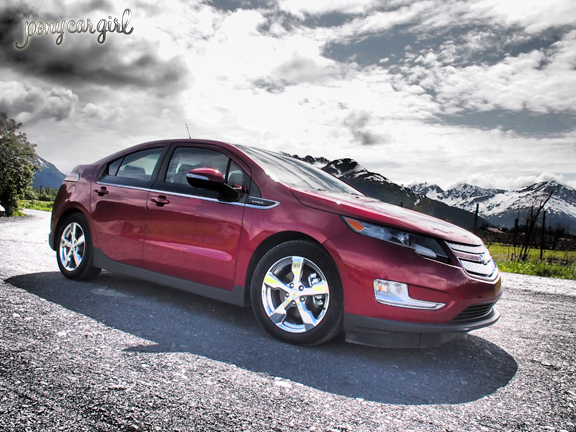 The Chevrolet Volt was designed specifically to be a long-range electric vehicle. Contrary to many people’s general impression, it is an entirely electric-powered vehicle and a hybrid. The electric range is 25-50 miles depending on weather and terrain. The 1.4L gasoline-powered engine kicks in after that only to support the electric system and the 435-pound lithium-ion battery system – the car is never directly powered by gasoline. How are you going to charge it in the middle of the wilderness? To be fair, I was only on the edge of the wilderness. In Seward, my accommodations were a lodge set-up; six or eight small buildings with rooms and ample parking in front. Each lodge had electric outlets on the outside. Recharging was really quite simple. The plug and cord is in a compartment in the trunk, you open the charging panel to the left of the driver’s side door, and you simply plug it in. Easy as that. It depends on what you plug it into. You can plug it into a regular, household 120V outlet, and it will take about 12 hours. If you have access to, or install, a 240V outlet, it recharges in around four hours. Typically, washing machines or dryers use 240V outlets, so it’s not a strange or difficult request to have or have a professional electrician install an outlet. The $37 million ChargePoint America program is set to install 4700 charging stations in homes and public areas by October 2011. This was made possible by a $15M grant funded by the American Recovery and Reinvestment Act through the Transportation Electrification Initiative administered by the Department of Energy. I doubt any of those will end up in Seward, Alaska, but expect to see more charging stations appear in regions where EVs are being sold. Wow. i don’t know which fascinated me more…the review or the pictures. 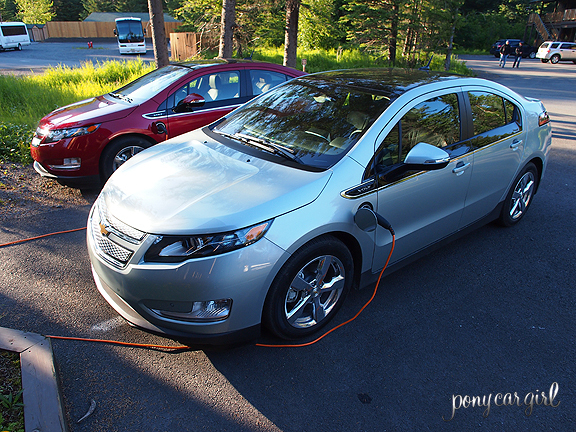 It’s about time that the public learns that the Volt isn’t just your urban short-trip vehicle. And it’s time for parking structures and meters to be set up so that we can charge while we work/shop.